Click here to read about a rally sponsored by the Northwest Electric Bicycle Network last year (read the full blog here). Although the Northwest Electric Bicycle Network is not officially organizing an event this year, electric bike riders will be congregating at 10:00 AM, Saturday, September 24th at the gate entrance to Golden Gardens Park in Seattle in support of the Moving Planet event. You are free to join in. It is suggested that riders form into groups of five or six, spaced out at five minute intervals to avoid causing traffic congestion at intersections and along the trail. The trail speed limit of 15 mph should be strictly adhered to. Each rider is of course on their own recognizance and will be responsible for their own safety if they choose to ride to Gas Works park. A group of regular bike riders will also be heading to Gas Works from Wallingford Park to rendezvous with electric bike riders. They will be heading from there to the South end of Lake Union to join the festivities and you are welcome to join them on that ride as well. Click here to view high resolution photo. Also ...pictured above is the latest incarnation of my electric bike (just finished it last week). My controller recently blew after almost five years of reliable service. It took out three of the four BMS circuit boards in my Dewalt battery packs as well. This seemed like a good time to upgrade my components. Go here to see a video of the original Ultimate Hybrid Electric Bicycle. I was using the old Crystalyte 408 motor and the bearings were starting to go out. I also wanted to upgrade to the latest CycleAnalyst power monitoring system so I could limit current draw by my motor and eliminate the magnet-based speedometer. I purchased my new components from Ebikes SF and everything works as advertised. Crystalyte has a new motor design that is bigger in diameter but thinner than the 400 series motors. It has more power for about the same weight and can accept a rear brake disk. They offer a version of the motor and controller that does not use halls sensors. Halls sensors are tiny little devices in the motor that send signals to the controller that allow it to send power back to the motor even when it is not spinning. Without halls sensors, the motor must start spinning before the controller will send power to it. This is called a sensorless motor/controller configuration. The advantage of not having halls sensors is that you are not prone to overcurrent your controller when starting up from a dead stop. You also have a simpler system that is less likely to fail because of a problem with a sensor. This new motor starts so fast and smooth with just a small amount of rotation that I can hardly tell the difference from my old version with sensors and it has quite a bit more power as well. Starting from a dead stop going up a steep hill will be problematic ...but that's always true and that is also how I blew my old controller. 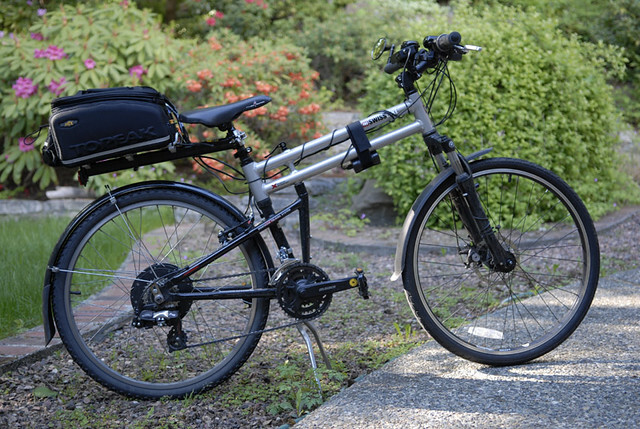 Ray Brown (co-founder of the Northwest Electric Bicycle Network) recently replaced his geared hub motor (bike pictured above), also purchased at Ebikes SF.